Transit, bikes, scooters, you name it; there’s an app for it. Thanks to smartphones, we have entered a new era of technologically enhanced public transportation. Today, there are a variety of multimodal apps helping connect users to various modes of transportation. These apps simplify our lives by taking the guessing game out of public transportation. According to a 2011 study, real-time information apps reduce anxiety over taking public transportation, reduce both perceived and actual wait times, allow passengers to pay with their smartphone and give passengers a stronger sense of freedom. Unfortunately, the majority of transportation apps tend to concentrate on urban areas and university towns, but expansion is on the horizon due to these apps’ growing demand and profitability. Beyond assisting the user, these apps are critical in the creation of a unified multimodal transit network. Multi-modal apps knit the transportation landscape together by allowing users to see side-by side comparisons of a variety of routes and services for making their trip. They fill in the gaps of the system by showing all the options available, even if that means hoping on a bike to take to the bus to the train. Detroit has been highly criticized for the gaps in its transit system left by the two separate transit agencies of DDOT and SMART. Multi-modal apps are a great asset in bringing together the different agencies and systems, like DDOT and SMART, under one umbrella. Amtrak rider uses their smartphone to show their ticket. Additionally, the Regional Transit Authority is looking to create a unified fare card to make the transfer from DDOT buses and SMART buses easier. The idea is to use “the latest technological advances such as swipeless cards or a smartphone” to switch from train to bus or bus to bus. This way the entire system can be paid for on your smartphone, making transitions from one system to another seamless. At Trans4M we are all about simplifying transportation for the average user, whether that means creating goofy graphics or informative videos. Below we have compiled a list of a few helpful transit apps you can use to help simplify public transportation. Transit App: This free global app provides information on cities around the world. So far transit service in Detroit (DDOT), Grand Rapids (The Rapid), and Ann Arbor (The Ride) are included in the app. While this app does not cover the entirety of Michigan’s transit services there is a chance for expansion. Users have the ability to go to the Transit App website and enter a city or service they wish to have transportation information for. Other users vote for the suggested regions, and if a region gets enough votes it could become the newest area covered in the Transit App. Moovit: Similar to the Transit App, Moovit covers cities from around the world. Here in Michigan that includes the cities of Detroit, Grand Rapids, and Ann Arbor. The free app gives commuters step by step directions to get around by train, light rail, bus, and other public transportation methods. Don’t have a smartphone? You can still use Moovit; just visit the Moovit website on a computer to map out your travel plans online. Since Moovit is updated with information posted by the individual riders, you are able to notify and get notified by other riders of delays, overcrowding, or other problems on certain routes. RideScout: This multi-modal app covers Ann Arbor and Detroit. In Ann Arbor it includes Amtrak, Curb, and The Ride. In Detroit it includes DDOT, Zipcar, Amtrak, and more. Ridescout provides all transit, bus, bike, taxi, car share, rideshare, parking and walking directions in one view, honing in on the multi-modal trip trend. Increasingly, people (notably, Millennials) want many options to get from one place to another. For example, if your daily commute includes traveling to a commuter train or express bus stop, you might sometimes want to walk, take a connecting bus line, or drive your personal car and park. Your modal choice will likely depend on the weather, time of day, reason for travel or a variety of other variables. Apps like RideScout bring all of those options together for a seamless interchange between modes. Like Moovit, the app is open to suggestions on areas it should expand to cover through its online website. Google Maps: Google Maps is probably the most useful app when it comes to public transportation systems in Michigan communities. If you don’t live in the cities the Transit App, Moovit App, or Ridescout cover, Google Maps provides information for almost all of the fixed-route public transit services in Michigan. While it may not be as interactive and informative as the Transit, Moovit, and Ridescout apps, it is extremely user friendly and many smartphones come equipped with the app that is popular for GPS assistance. Google Maps allows you to choose between different modes of transportation including train, bus, biking, and walking and is frequently updated to incorporate service changes. Bike Sharing Apps: For the biking enthusiasts out there, or just someone looking for a physically active commute, there are a few apps to enhance your travels. Bicyclette and Spotcycle are among the most popular bike sharing apps on the market. Unfortunately, these apps do not include Michigan cities yet, but are great to use in bigger cities such as Chicago, Minneapolis, and even Paris. Get information on the location of stations, pricing, and open spaces to return bikes to. These are only a few of the many apps to help connect people to a variety of transportation options. In the years to come we can expect an even greater number of the apps to appear on the market. For example, in San Francisco there are Scoot Networks that provide riders with access to a network of electric scooters to use for running errands or just riding around town. The possibilities for innovative transportation are bright and limitless! We’d love to hear about your experiences! 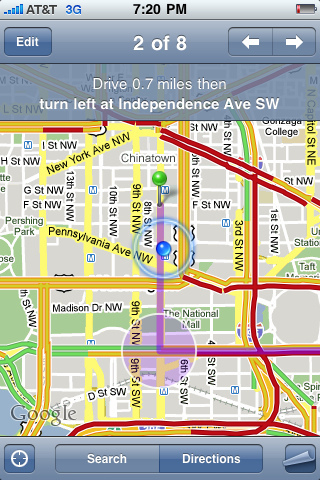 Do you use any transit or multi-modal transportation apps to help you navigate your trips? Which ones are your favorite and what do you like about them?